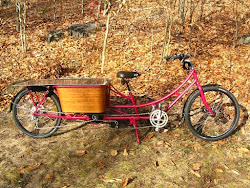 I started out building both bikes last winter, but as you can tell from the pictures only the bakfiets was done in time for the Fourth of July parade. That's ok, as it has been a blast to ride, and I'll use some of the lessons learned from it when I finish the longtail this winter. 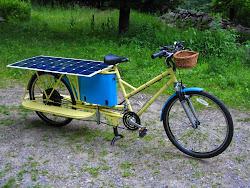 A solar electric cargo bike looked like a decent car substitute, but there were several problems to think about. One of the first questions was speed, because I didn't want to take half the day to get to White River Junction and another half getting back. However I also knew that the average speed in a car is much lower than the driving speed. The travel time might be more dependent on stop signs and traffic than on a car's superior speed. After carefully measuring 13 trips over the last several months, it's turned out that a trip to the center, (6 miles one way), takes 13 minutes in my car, and 21 minutes on the bike, which is 1.6 times longer. Surprisingly, the longer trip to WRJ (16 miles one way) didn't give the car a huge advantage, taking 29 minutes in the car, and 56 on the bike, or 1.9 times as long. The bike trip computer usually shows my riding speed between 16 to 19 mph, and improvements are planned for the second bike that I think will raise the speed a few mph more, reducing the time difference. A stop at recycling on the way. Thirty five miles has turned out to be a soft limit of this first design for a few reasons. First of all I'm not in shape, and a trip of 1 hour 52 minutes riding time is a fair amount for someone who is not used to sitting on a bike. Secondly, I used the gearset from an old mountain bike and it has a small front gear. When I'm going 20 mph, I'm pedaling pretty fast, and at 25 mph I'm pedaling really fast. I find that I'm riding around in top gear 98% of the time, and shift down to the middle front gear only for the really steep hills. The speed then drops to 12 to 14 mph with moderately hard pedaling. On the other hand, I routinely hit 35 mph going down hills, and a few times have gone 41 mph. 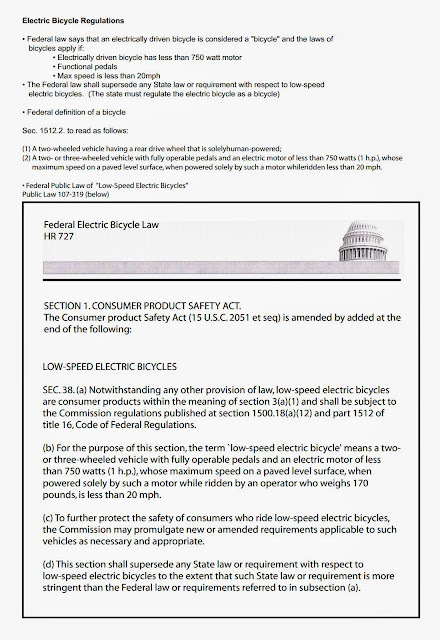 This formatted copy is from Electric Bike Solutions (GoCarLite), click on image to enlarge. Obviously I wish to go fast enough to replace my car, but not fast enough to make it a registered vehicle. There are at least a half dozen ways I can legally improve the speed, but I don't wish to game the system so much that it causes trouble. 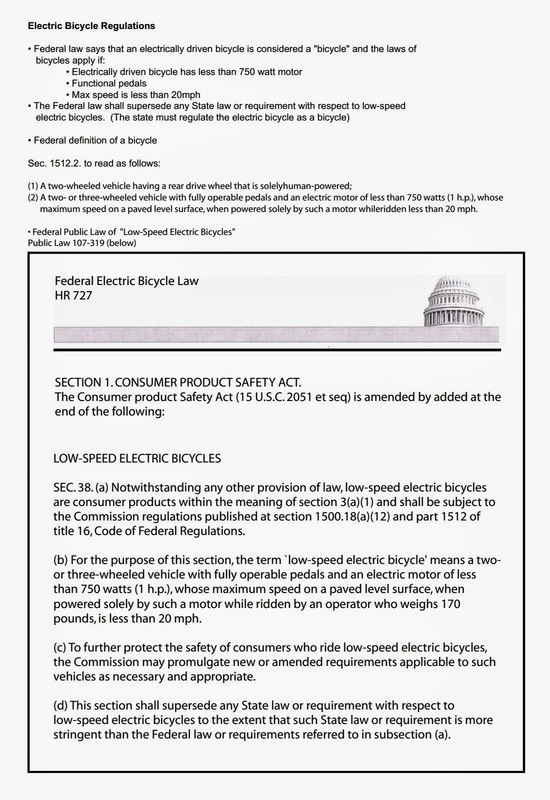 There are bikes out there that are topping out in the 60 to 80 mph range, and electric bicycles have been banned in parts of NYC because the bicycle messengers were abusing their power. I'll cover more of this in a later post, but for now I'll just say that the solar electric cargo bike tops out under motor power at 20 mph on a flat level road with me on it.